Hurricane Harvey struck Houston, Texas, on August 26, 2017, and went on to become one of the most devastating natural disasters on record. Entire neighborhoods were flooded or severely damaged, and thousands of people were forced to evacuate. 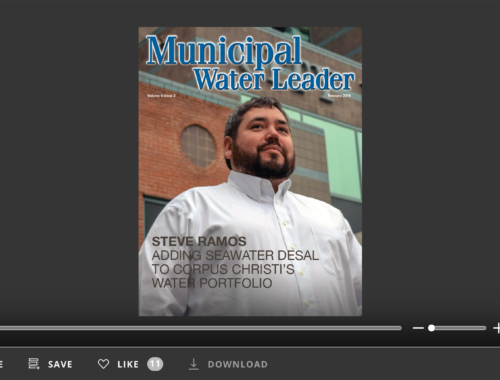 While the efforts to protect people and homes are well known, the story of the efforts of Houston Water’s Drinking Water Operations (DWO) Branch to protect the city’s drinking water is not. For several days, DWO personnel worked to keep clean drinking water flowing to our customers. Our efforts helped our communities endure the storm and kept a difficult situation from becoming worse. Houston is the fourth-largest city in the country and has a demand for drinking water to match. DWO’s water capacity of approximately 800 million gallons per day is split between surface water and groundwater. Surface water is the predominant source of the water we provide to our customers, with a daily maximum capacity of approximately 635 million gallons per day. Our groundwater capacity is approximately 180 million gallons per day. We have 7,500 miles of pipeline across a 600-square-mile area, and we provide drinking water to about 4 million customers, which includes our direct retail customers in Houston as well as regional customers to whom we sell wholesale water. 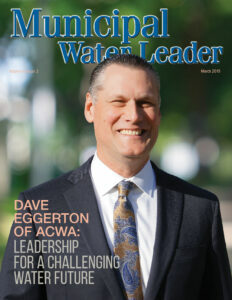 The city shifted away from groundwater to surface water in the late 1980s because the regulatory environment required the city and surrounding counties to alter the makeup of their water sources. Many areas have experienced significant subsidence: Some areas have sunk 5–15 feet due to excessive groundwater pumping and the clay composition of the soil. 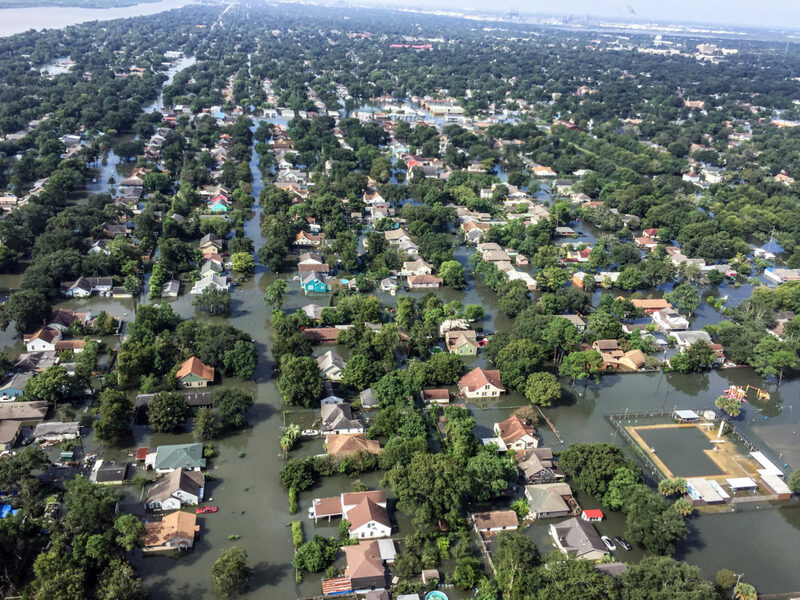 The combination of subsidence and extreme weather events puts Houston at a greater risk for flooding. Our three surface water treatment plants—the northeast plant, the east plant, and the southeast plant—are located on the eastern side of the city and convey drinking water to the west. The northeast plant is the smallest, with a capacity of 80 million gallon per day, but it is being expanded to an eventual 400 million gallons per day capacity. That project is the largest active water treatment plant expansion project in the world, at a cost of approximately $1.5 billion. All those facilities were put to the test with the arrival of Hurricane Harvey. Harvey grew from a tropical depression on August 23 to a category 4 hurricane as it approached the Texas coast 2 days later. The rapid rate of change was somewhat of a surprise to meteorologists and ultimately meant quick and nimble activation of emergency preparedness plans. As the storm neared, we worked hard to finalize our preparations to ensure that the right people were on duty at the right places. Ultimately, we mobilized over 100 staff to key locations on Saturday, August 26, with the expectation that they would be onsite 24/7 for approximately 3–4 days at the most. Many would work tirelessly and not get home for 3 days, some up to 5 days on the job. All three of the treatment plants were manned during the storm, along with other facilities within our distribution system. We knew there would be significant flooding, and we wanted to make sure our people were in place beforehand. We also ensured that all the chemical tanks were topped off with sufficient chemicals to allow us to treat water for 15 days or longer. Our fuel tanks were topped off before the storm as well. 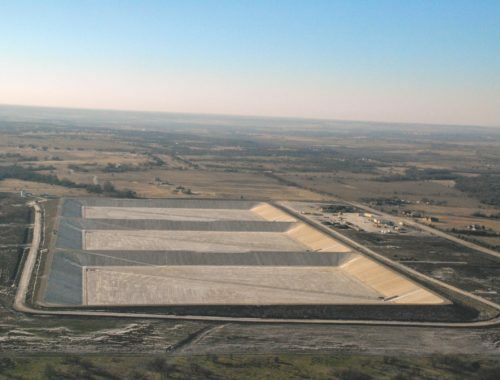 The east and southeast water treatment plants have onsite landfills for the disposal of the sludge from their dewatering processes, but the northeast plant does not and normally has to use a commercial landfill approximately 5 miles away. We knew that the landfill would likely close in the event of significant flooding, so we brought in 10 extra tractor trailers to store sludge in the interim until the landfill reopened. The landfill ultimately was closed for several days, but the trailers allowed us to store sludge safely during that time. There was also a daily call at 9:00 a.m. for all the key resource managers, to check on the operational status of each facility. At the height of the storm, all three of our surface water plants were completely cut off from the outside world. There was no way we could get in to or out of any of them by vehicle. All the plants had some flooding issues, but the northeast was the hardest hit and was flooded such that no one could get into the area via the highway, no one could drive a vehicle inside the plant, and workers had to wear waders to walk from one part of the facility to another in waist-deep water. This made it very difficult to check on important pieces of equipment. Each plant has a central control room, but it is important to visually and physically inspect the equipment as well. Our instruments also take continuous samples, measure them, and report the data to the control room through SCADA. 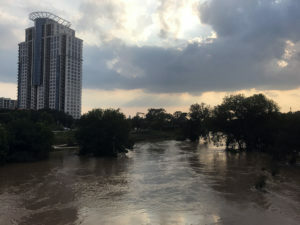 Normally, we collect samples every 4 hours to ensure regulatory compliance and verify the automated systems; however, the flooding made those tasks impossible, so we had to trust the data from our SCADA system. All three of the plants have generators that were installed in 2013 as a result of Hurricane Ike. 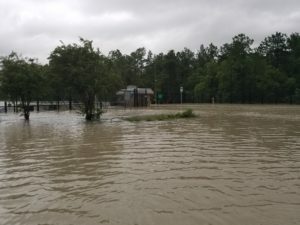 None of the treatment plants ever lost power during Harvey, but the northeast plant came very close to going offline because the backwash system nearly failed. We have 16 filters that have to be cleaned approximately every 48 hours by taking 500,000 gallons of clean, potable, chlorinated water from our storage tanks. The dirty water from the filter is normally flushed into the backwash pond; however, during the storm, the backwash pond was completely flooded, and the pumps could not overcome the head pressure of the pond. Late Sunday night, August 27, we suspected that we were going to have difficulty maintaining the plant through the entire storm if we did not drastically cut the production. The decision was made to reduce flow to approximately 25 percent of the total plant design capacity in order to preserve the filters, since backwash was not possible. This reduction in flow was possible because the rest of our system was able to make up for the loss this capacity. Additionally, we had system pressures being monitored by Kira Smith, managing engineer of our Water Quality Group, to ensure that we were compliant with minimum pressure regulations while communicating with state regulators. 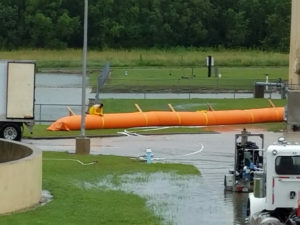 With major assistance from city leadership, including Public Works Deputy Director Jeff Weatherford and Houston Water Executive Director Yvonne Forrest, we made an emergency purchase of a tiger dam to address flooding of the backwash pond. We constructed the dam around the backwash pond, installed pumps and a suction hose on the inside of the dam, and pumped the stormwater from the backwash pond to a stormwater ditch about 2,000 feet from the plant. BRH Garver’s Peck Boswell was the key contractor who facilitated and coordinated this effort from the field. 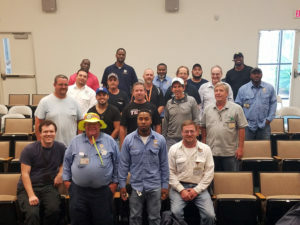 Additionally, plant staff, including Chris Thompson, Ken Dement, Scott Barker, Eric Garza, and Chris O’Donnell, to name a few, were instrumental in implementing the mitigation measures. Ultimately, the mayor authorized the emergency purchase order of the tiger dam and the pumps used to convey the stormwater out of the backwash pond and to the appropriate drainage ditch. Despite our ability to maintain operations during Harvey, Houston Water still faces long-term challenges to keeping our infrastructure functioning going forward. One of our top goals is developing accurate and efficient asset management systems that will improve how long-term investments are made to our Capital Improvement Plan. We are currently in the process of fine-tuning our asset management systems so we can account for all our assets and their condition. Our goal is to couple that information with consequence-of-failure analyses to determine what will happen if a given asset fails and come up with a condition-based program that we can use to understand the useful lifespan of the assets, both individually and collectively. We then want to articulate that information to our elected officials and other stakeholders, to enhance trust and transparency in our processes. 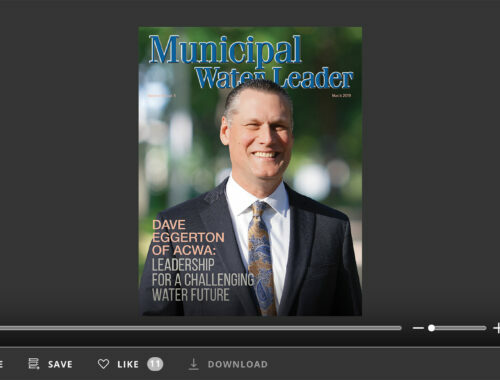 The more trust we can build, the more support we will have when the time comes for the city and its regional water authority partners to fund new projects. There will always be some shifting of priorities as circumstances change, but improving that process will be a major focus for us going forward and will help us to be better prepared for future natural disasters. Drew Molly, PE, is the assistant senior director of the Drinking Water Operations Branch of Houston Water. You can reach him at Andrew.Molly@houstontx.gov.